Established in Baden-Baden since its birth in 1978, the Grenke group is a giant of bank, factoring and leasing services. Grenke began sponsoring German chess in the mid-nineties, but has since then focused on the Baden-Baden club itself and, from 2013 onwards, on the support of a great Easter Festival, with more than 1500 players ! Since 2017, the Grenke Classic opens its doors in Karlsrühe, in the same playing hall than the gigantic opens, before to continue in a cosier atmosphere, within the Kulturhaus of Baden-Baden. Grenke is the first top level tournament of the year for Maxime, and it began rather well for him, with 2.5 out of the first three rounds. Thus, it is as coleader that he approached the short transportation (about 40 kms/25 miles) towards Baden-Baden on Tuesday, April 3, which happened to be the one and only rest day. 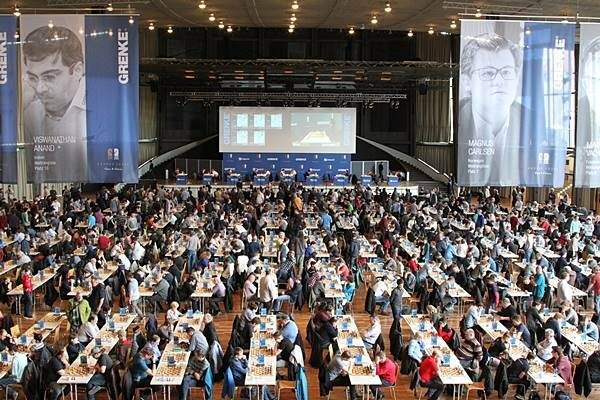 With 1500 joueurs around, selfies and autographs are unavoidable (photo Grenke Chess). The Azeri IGM and teammate of Maxime has never been an easy opponent for him. Last year, also in the first round, Maxime had been caught off guard and lost with white. 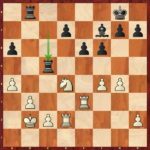 Again this year, Arkadij succeeded in creating problems, using the Torre Attack, though he was helped by the frenchman being too optimistic on the Kingside and overextending with …g5 and ..f5. 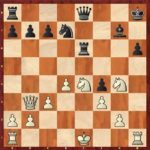 Thanks to a very interesting piece sacrifice (14.Nxd5!? ), Arkadij introduced massive tactical complications, culminating with an exchange counter-sacrifice by Maxime (22…Rxe4+!). 22…Rxe4+! compulsory at the end of the variation, as otherwise it’s just a mere pawn down for black. As so often in such circumstances, some sort of dynamic equilibrium was found after the chaos, even if white still stood objectively better, but with fair practical chances for black, enhanced by Arkadij’s time trouble. And so the game concluded with a perpetual check just after the time control ! The former world champion took Maxime by surprise with a Taimanov Sicilian, an opening which doesn’t belong at all to his opening repertoire ! But Maxime had made his homework with the very rare 10.a3. Both players got out from theory on the next move, but not from their preparation, even if Maxime seemed to have things better anticipated with the clever 12.Ba4! ?, which sets a lot of pratical problems. After a long 33-minute think, Anand entered the critical line with 12…Nxe4, which seems to maintain white’s pressure within acceptable bounds. But imperceptibly, Maxime moved forward, first by exchanging queens in good conditions, then by gaining space on both sides of the board (26.g4, 27.a4). Under such pressure, the Indian player commited a mistake which allowed white to infiltrate a rook on d6. 27…Rc5?, a mistake with far-reaching consequences. From now on in an awkward situation, Anand quickly deteriorated his position, and finally resigned ten moves later. As he explained in the post-game interview, « when things start to go downhill, you completely lose the plot. You don’t like this, you don’t like that, and finally you just make the worse move ! ». A funny opening for this last game in Karlsrühe, with a double fianchetto by both sides leading to some sort of Hedgehog where black touches none of both his central pawns ! After a subsequent exchange of white’s c for black’s d pawn, the position became symetrical, but still fluid an open, with only a pair of rooks exchanged. But the young Chinese player commited two unconspicuous inaccuracies in a row (25.Qe3 and 26.Nd3), after which Maxime could launch a pawn expansion on the queenside, winning an outpost for his Knight on c3. 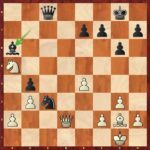 So black was then the one who fought for the initiative, and instead of resigning himself to the prospect of an equal ending by 32…Bxe4, Maxime invented the impressive pawn sacrifice 32…Ba6!. After 32…Ba6! instead of 32…Bxe4, Hou will not understand that 33.Bf3 is an absolute forced move in reply. Overwhelmed, the female world #1 didn’t find the only defence, and was quickly punished. Analysing with commentators Jan Gustafsson and Peter Leko (photo Grenke Chess). With two wins and a draw to his credit, Maxime shares first place with Nikita Vitiugov after the Karlsrühe leg. Half a point below, you’ll find a group of three pursuers, and not insignificant ones, as they are none others than Carlsen, Caruana and Aronian ! 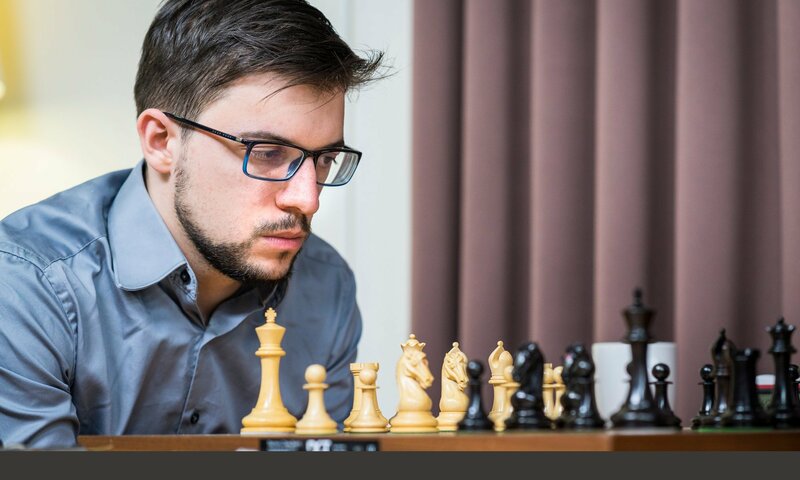 Round 4 will take place on Wednesday, April 4, at 3pm and Maxime, with black, will precisely have to ward off the attack of World Champion Magnus Carlsen ! Maxime, busy talking with Rustam Kasimdzhanov, Caruana’s coach (photo Grenke Chess). Party time Part of the night before the transfer to Baden-Baden turned out to be an outlet for compulsive players ! 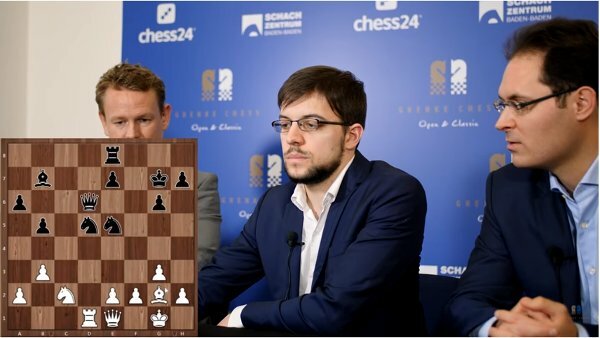 First and foremost were the unavoidable bughouse games where, apart from Maxime, Fabiano Caruana, Rustam Kasimdzhanov, Levon Aronian and Jules Moussard illustrated themselves. For the most motivated ones, a few sessions of Time’s up and Tarot followed, where you could find worthy representatives of the Festival’s francophone participants, among them both Maxime (Mvl and Lagarde), Jules Moussard, Etienne Bacrot, Adrien Demuth, Quentin Loiseau, Pierre Barbot, as well as Fiona Steil-Antoni.